EUROZONE (AUS) (Chestnut 2010-Stud 2014). 4 wins-2 at 2-from 1100m to 1500m, A$476,080, ATC Stan Fox S., Gr.2, Rosebud H., L, 2d MRC CF Orr S., Gr.1. Half-brother to SW Miss Marielle (STC Hill S., Gr.2). Sire of SW Krone (SAJC Cinderella S., L) and of J'Adore, Pizonie, In Her Zone, Masterbrax and of the placegetters Brittex, Eurogem, Euroglider, Eurosay, Global Impact, Lundagin Mo Baby, Moore Euros, The Euro, etc. His oldest progeny are 3YOs. I'm Dun Dreamin' (g. by Dundeel). Winner at 1500m in 2018-19 in Aust. Margays (f. by Denman). Placed at 3 in 2017-18 in Aust. Trichologist (War Pass). 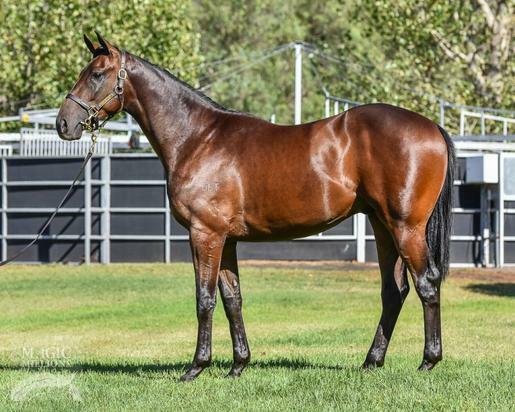 3 wins-2 at 2-to 1200m, A$202,500, WATC Bacteria Eliminator 2YO P., Westspeed 2YO P., 2d WATC Karrakatta P., Gr.2, Sires' Produce S., Gr.3, Westspeed 2YO P., 4th WATC Perth S., L.
Athenas Gift. 4 wins from 1350m to 1650m, A$161,700, BTC Glenlogan Park H., Bluescope Lysaght H., BRC Mullins Lawyers P., BTC The Good Guys H., 2d BTC Watpac Constructions 3YO H., Dream It Up H., BRC Knauf H., Superior Broadband Services P., Don Alroe & Sons P., BTC Axis Air Brisbane Bloodstock 2YO H., 3d QTC Never Undercharge H., BRC R&S Scraper Hire H., Optimum Recruitment Group P., QTC Lyndhurst Stud P.
Binky Toy. 2 wins at 1200m, 1400m, WATC Westminster National Business Finance H., 2d WATC Westspeed H.-twice, 4th WATC Ascot One Thousand Guineas, L.
Bengal Angel. 8 wins. See above. Princess Spur. Winner at 1200m in Aust. Foscat. 8 wins. See above. Ace of Pace. 4 wins at 1200m, 1400m, HK$2,858,375, HKJC Ashley H., Hyderabad H., Aetna Agency 06 H., Cannon H., 2d HKJC Washington DC H., Big Wave Bay H., Mount Collinson H., Panasonic Momi-Momi Massage Lounger H., Oi Man H., Rambler Channel H., Tai Hing H., Ping Shek H., 3d HKJC Hornell Hall H., Enjoy Yourself Tonight H.
WATERFORD ROAD (Danehill). 9 wins from 1200m to 2000m, A$273,515, QTC Exhibition H., L, Werribee Cup, L, Kilmore Cup, L, 2d VATC Naturalism S., L, Heatherlie H., L. Sire. LIONS GATE (Danehill). 3 wins from 1450m to 2200m, A$160,760, Geelong Classic, L, MRC Corps of Commissionaires H., SAJC Gold Ace at Glenrae Stud P., 2d SAJC Port Adelaide Guineas, L, Hill-Smith S., L.